The initials RBMK are an acronym for "reactor cooled with water and moderated by graphite" (Russian: reaktor bolshoy moshchnosti kanalniy - Реактор Большой Мощности Канальный). It is one of two types of reactors that the Soviets were using in 1986. 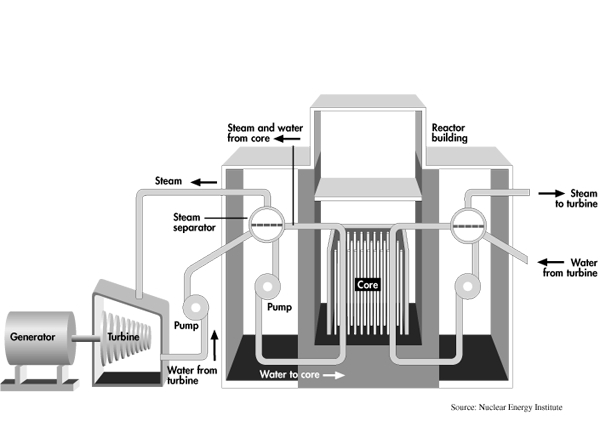 The other type of reactors is more recent and could be assimilated to the American pressurized water reactor. The Soviet Union has built 17 RBMK reactors. Thirteen are still operating in 2007 (source: www.world-nuclear.org). Kursk: 4 RBMK 1000 reactors expected to stop in 2014, 2016, 2022 and 2024 plus two RBMK reactors whose construction has been suspended. In fact, the lifetime of these reactors was extended to 2021, 2024, 2029 and 2030 respectively. Leningrad: 4 RBMK 1000 reactors active until 2010, 2011, 2019, 2021. In reality 2016, 2017, 2024 and 2025. Smolensk: 3 RBMK 1000 reactors active until 2013, 2015, 2023. In reality 2020, 2027 and 2030. Ignalina: 2 RBMK 1500 reactors (the most powerful in the world) active until 2004 and 2009. These two reactors were actually shut down on December 31, 2004 and December 31, 2009. After the accident in 1986, significant changes were made to the RBMK reactors in operation. Two photos from Google Earth : left, Chernobyl's power plant and its sarcophagus and right, Kursk's power plant (Russia) still active. On both satellite photos, we see the perfect similarity of the two power plants of Chernobyl and Kursk.